Dengue fever and dengue hemorrhagic fever (DHF) are acute febrile diseases, found in the tropics and Africa, and caused by four closely related virus serotypes of the genus Flavivirus, family Flaviviridae.The geographical spread is similar to malaria, but unlike malaria, dengue is often found in urban areas of tropical nations, including Singapore, Taiwan, Indonesia, Philippines, India and Brazil. Each serotype is sufficiently different that there is no cross-protection and epidemics caused by multiple serotypes (hyperendemicity) can occur. Dengue is transmitted to humans by the Aedes aegypti (rarely Aedes albopictus) mosquito, which feeds during the day. Dengue (DF) and dengue hemorrhagic fever (DHF) are caused by one of four closely related, but antigenically distinct, virus serotypes (DEN-1, DEN-2, DEN-3, and DEN-4), of the genus Flavivirus. Infection with one of these serotypes provides immunity to only that serotype for life, so persons living in a dengue-endemic area can have more than one dengue infection during their lifetime. DF and DHF are primarily diseases of tropical and sub tropical areas, and the four different dengue serotypes are maintained in a cycle that involves humans and the Aedes mosquito. However, Aedes aegypti, a domestic, day-biting mosquito that prefers to feed on humans, is the most common Aedes species. Infections produce a spectrum of clinical illness ranging from a nonspecific viral syndrome to severe and fatal hemorrhagic disease. 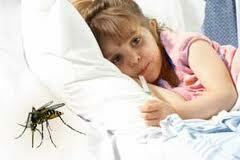 Dengue hemorrhagic fever is a more severe form of the viral illness. Manifestations include headache, fever, rash, and evidence of hemorrhage in the body. Petechiae (small red or purple blisters under the skin), bleeding in the nose or gums, black stools, or easy bruising are all possible signs of hemorrhage. This form of dengue fever can be life-threatening or even fatal. Infection with the dengue virus may be subclinical (no apparent symptoms) or may cause illness ranging from a mild fever to a severe, even fatal condition, ie.dengue haemorrhagic fever or dengue shock syndrome. Fever and other signs of dengue last for two to four days, followed by rapid drop in temperature (defervescence) with profuse sweating. This precedes a period with normal temperature and a sense of well-being that lasts about a day. A second rapid rise in temperature follows. A characteristic rash appears along with the fever and spreads from the extremities to cover the entire body except the face. The palms and soles may be bright red and swollen. A flat, red rash may appear over most of the body early during the fever. A second rash, measles-like in appearance, appears later in the disease. Infected people may have increased skin sensitivity and are very uncomfortable. The classic dengue fever lasts about six to seven days, with a smaller peak of fever at the trailing end of the fever (the so-called 'biphasic pattern'). Clinically, the platelet count will drop until the patient\'s temperature is normal. Basically, dengue commences with high fever and other signs as listed above for 2 to 4 days. Then, the temperature drops rapidly and intense sweating takes place. After about a day with normal temperature and a feeling of well-being, the temperature rises abruptly again. Rashes (small red bumps) show up on the arms, legs and the entire body simultaneously along with fever. However, rashes rarely occur on the face. The palms of the hands and soles of the feet may be swollen and bright red.